British Ceramic Tiles. 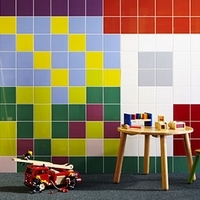 Colour Compendium is a colourful collection of smooth ceramic wall tiles, from British Ceramic Tile. Use a mix of three or four colours to create your own unique blend, or use one colour as a base and add a contrasting colour to create a border or feature area.